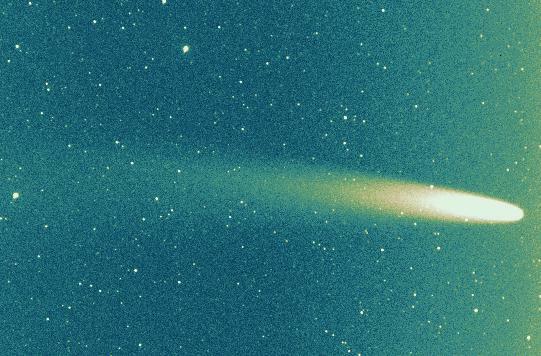 First image is a wide-field mosaic image of comet Hyakutake, taken on 1996 Apr. 21, with the 2.8/180mm lens, CCD and narrow-band H2O+ filter, centered at 620nm (FWHM=10nm). Three consecutive frames were taken between 19:16 and 19:37UT. Each frame was exposed for 3 minutes. The frame field of view is 10.7x1.9 deg. Third image is a wide-field image of comet Hyakutake dust tail, obtained on 1996 Apr. 21 with the 2.8/180mm lens, CCD and dust continuum filter, centered at 647nm (FWHM=10nm). Exposure time was 2 minutes, starting at 19:12UT. The frame field size is 3.8x2.5 deg. 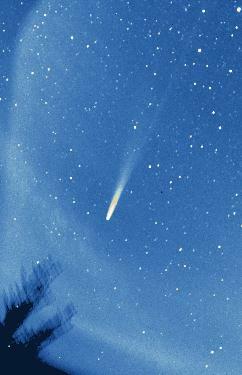 Fourth image is a wide-field image of comet Hyakutake, obtained on 1996 Apr. 21 with the 2.8/35mm lens, ST-6 CCD and V filter. Exposure time was 2 minutes, starting at 19:26UT. The frame field of view is 14x10deg.